In West Virginia there are gambling options for residents and visitors in the form of casinos and two horse and dog tracks. These tracks are also called “racinos”, as there are video lottery machines there. Sports betting is now legal after the state introduced legislation in 2018 and again in 2019 to make online sports betting legal too. The most gambling options for West Virginia residents is online with the many casinos, racebooks, sportsbooks, and poker rooms on the net today. In West Virginia sports betting is now legal and a number of sportsbooks are being established in partnership with the state’s major casinos. On May 18th of 2018 the Professional and Amateur Sports Protection Act was overturned by the U.S Supreme Court. What this did was pave the way for legal sports betting on a state-by-state basis and West Virginia was one of the first states to take that option in June of 2018. Sports betting is regulated and taxed within the state and the financial gains are significant. West Virginia has been on the forefront of making sports betting legal and in March 2018 state legislature passed a new sports betting bill and the West Virginia Lottery Commission would regulate the sports betting. The law included the legalization of sports gambling in person and online and the betting regulations in the law were announced in June 2018. As stated before, West Virginia has made sports betting legal, paving the way for a number of options for punters to bet on their favourite sports online. There are many sportsbooks online today that have a good reputation and offer players many things besides the action of betting on sports. However, with many sportsbooks online take some time to do a little homework to find the best one for you. You definitely want to make sure the book you wager at has very solid player security, as you want your personal and financial information 100% secure. Other very important things you should look for in the sportsbook you want to sign up at is many sports with lines, many bet types, a variety of banking (deposit and withdrawal) options, 24/7 customer service, and attractive bonuses and promotions. It is a good idea to check for books with Live Chat customer service to get issues resolved in a quick manner. Also, in terms of bonuses and promotions they all have gambling requirements associated with them, so be sure you can meet them so you can take advantage of bonus money offered. Below are three reputable online sportsbooks that accept wagers from U.S. residents. BetOnline.ag – This established and popular sportsbook has it all, and more, when it comes to what a good online book should have and should offer their players. They are one of the best sportsbooks when it comes to sports offered and bet types and they have very lucrative bonuses and promotions. Live Chat is offered in their great 24/7 customer service and besides the great sportsbook BetOnline.ag also has a poker room and a casino with Live Dealer games. Sportsbetting.ag – This solid book has a great parent company in the one above and like BetOnline.ag they offer all their parent does. Both are known for their bet types, which are aplenty, including the very popular mobile betting and Live Betting. Sportsbetting.ag is a solid choice for an online sportsbook giving their players many sports betting options. Xbet.ag – This is one of the sleeker sportsbooks on the Net today, but the site is chock full of sports betting information and also easy to navigate. Their banking options are aplenty, as are the sports they have lines for, bet types, and ever-changing bonuses and promotions. Horse racing is legal in West Virginia as is parimutuel wagering at the tracks if it is licensed by the state. There are not many tracks in West Virginia, but they do offer betting options on quite a few races. However, online there are many more betting options, races are always offered from tracks around the world, and racing takes place all year. Online many of the racebooks also offer special bonuses and promotions and more betting options for the bigger races such as the three in the Triple Crown. You would be surprised how many proposition bets and unique bonuses are available when the Kentucky Derby rolls around. There are many reputable racebooks online today that offer many races in a wide variety of stakes. 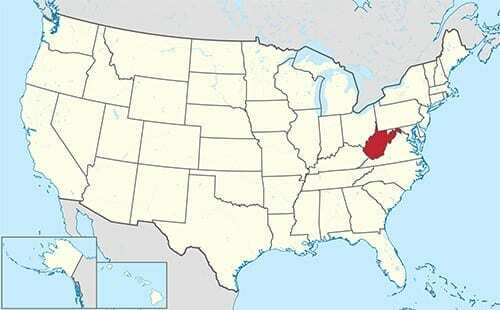 Poker is legal in West Virginia, but only in the state licensed casinos with no land-based poker rooms. There are different variations of poker and different stakes at the tables at the West Virginia Casinos and also many more with the abundance of poker rooms online. The top poker rooms will not only accept wagers from U.S. residents, but also have a ton of variation games, tournaments, and games at all times for any type of player no matter their bankroll. Like many other betting sites poker rooms will also offer bonuses and promotions and it is a good idea to do some research to find one just right for your poker playing style. Code Chapter 29 in West Virginia law deals with video lottery, limited video lottery, and racetrack lottery and Articles 22A, 22B and 22C touches on table gaming in the state in the casinos. The state is not strict on the laws and even getting caught is a misdemeanour, which is a fine from $5 to $100.